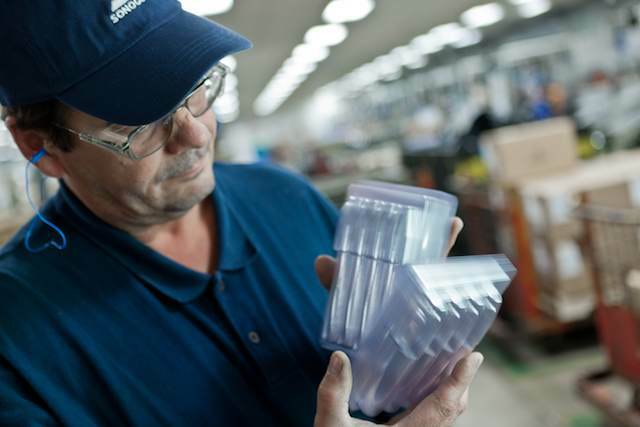 With full-service product packaging design capabilities, Sonoco Alloyd creates total packaging solutions for manufacturers from “concept to shelf.” Only Sonoco Alloyd offers the complete packaging value proposition: initial design, thermoforming, print, sealing machines and tool manufacturing. Our custom-engineered solutions build brand loyalty, lower costs, protect the security and integrity of your products, and increase sales. We help put products in the hands of the people who need them. The Alloyd brand began in 1961 when the first two-station rotary heat seal machine was manufactured, forever transforming the packaging industry. From there, Alloyd began thermoforming production in 1969 and continued to provide innovative sealing equipment to manufacturers with the introduction of the automatic 6-station blister packaging machine. To further its competitiveness in the retail packaging, medical, and automotive markets, Alloyd purchased the Callanan Company, an RF (Radio Frequency) plastic welding systems manufacturer, ultimately extending operations to include thermoforming facilities in Tijuana, Mexico and Spartanburg, South Carolina. Later, Alloyd acquired Dot Packaging, a blister card and folding carton printer, in order to become the first and only packaging company to offer the full value proposition from start to finish: package design, thermoformed blister, printed cards and cartons, seal tooling, and sealing equipment. This completive advantage still holds true today: Sonoco Alloyd blisters assured to feed and seal to Sonoco Alloyd blister cards using Sonoco Alloyd heat seal machines. In 2011, Alloyd was purchased by Sonoco and became Sonoco Alloyd, furthering our scope of innovative packaging solutions. Founded in 1899, Sonoco is a global provider of a variety of consumer packaging, industrial products, protective packaging and packaging supply chain services. With annualized net sales of approximately $5 billion, the Company has 20,000 employees working in more than 300 facilities in 33 countries, serving many of the world’s best known brands in some 85 nations. For more information on the Company, visit www.sonoco.com. From our DeKalb, Ill., headquarters and strategically placed facilities throughout the U.S. and Mexico, Sonoco Alloyd crafts packaging solutions for an array of industries. Sonoco Alloyd blisters, cards, seal tooling and sealing machines are sold by a direct sales force and maintained by an in-house team of service technicians. Sonoco Alloyd is a proud member of the Association of Visual Packaging Manufacturers. This nonprofit organization aids in developing innovative ways to promote the usage of blister cards, skin packaging board, thermoformed blisters, blister film, paperboard, coating and sealing equipment.